File Fold (v.) The act of folding clothes and linens to “stand on end” in a line, one item behind another. Your thongs. (Yes, I said thongs. You are either mortified right now or completely delighted.) No exception here, really. I like to use drawer organizers like this or this to hold these, without having to fold each one. Socks - Kids, ankle or no-show. I prefer folding one into another vs. file folding because they are more likely going to stay together that way, especially if your laundry basket is the hoop during a game of laundry basketball (She fades back, she shoots, she scores. You get the picture). For families with young kids, this is simply more practical. If we work together it is probably because you do not have the time, resources, or will power to do this yourself. I will not put the expectation on you to file fold these items in your closet after I leave. 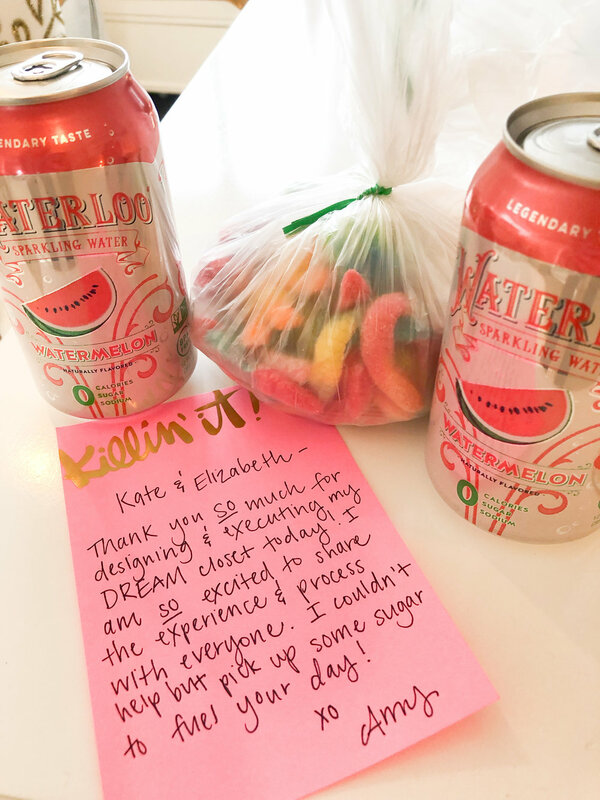 Baby steps. Organization is not a one time thing. It’s truly a lifestyle and I don’t want you spending your precious time folding your unmentionables. You see EVERYTHING. Nothing is underneath something else, but instead in a nice straight line like a kindergarten class going to recess. You can FIT MORE in the same space. Think about your tee shirts. 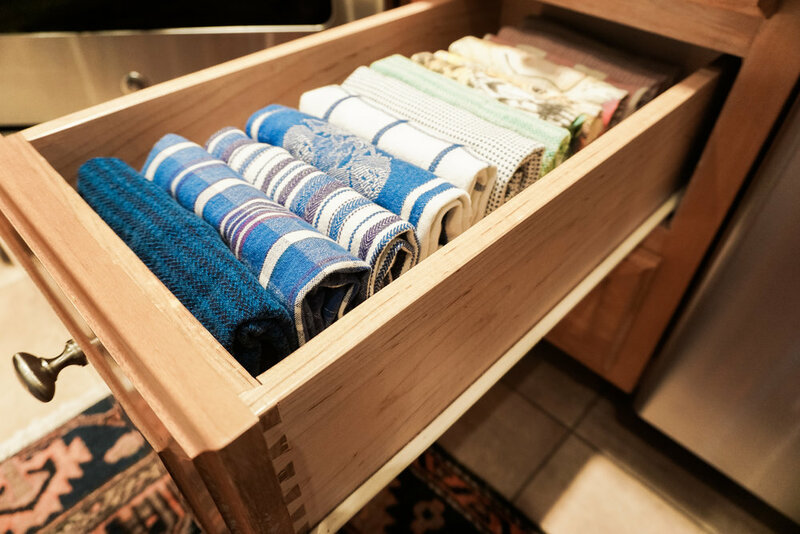 If you fold them and stack them you are only utilizing the height of the drawer which often times is the shortest measurement of that space. File folding gives you the opportunity to take advantage of the depth or sometimes width of the drawer, certainly a much greater distance on average. MATH! Over time, you will be able to EASILY weed out items you don’t need / use. Let’s use dish towels as an example. You have one drawer with file folded towels front to back. You use one, two, maybe three at a time. Then you do laundry. You put them back in the front. You do this over and over and realize that the 5 towels in the back haven’t been touched in a year and can probably go. Thank you, bye. Visual clutter is reduced. 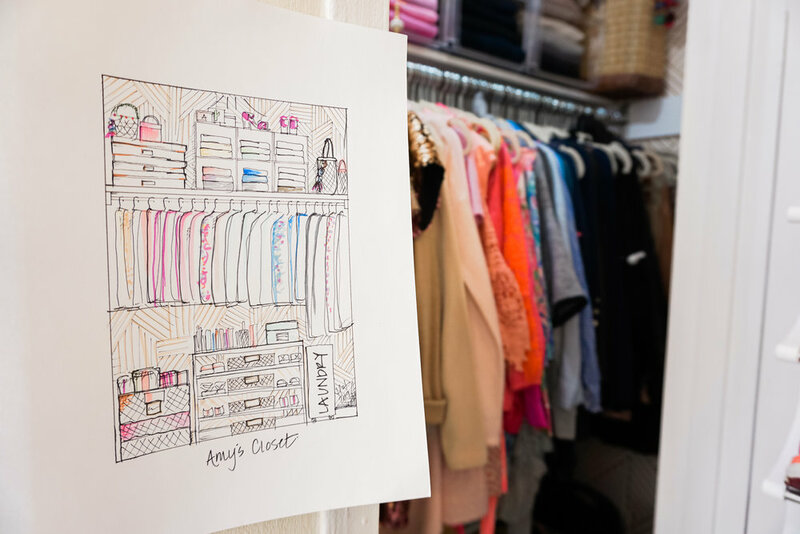 Admittedly, I honed my folding skills doing visual merchandising for J.Crew for five years. 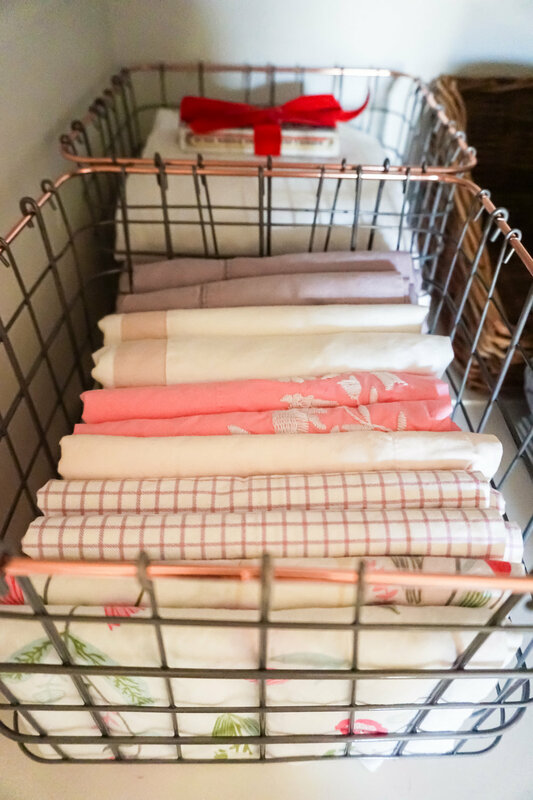 I am going to share my tips on folding in an upcoming blog, but for now be confident in knowing that after folding one or two loads of laundry in this method, you will get the hang of it. The best part is that there isn’t one way to file fold. 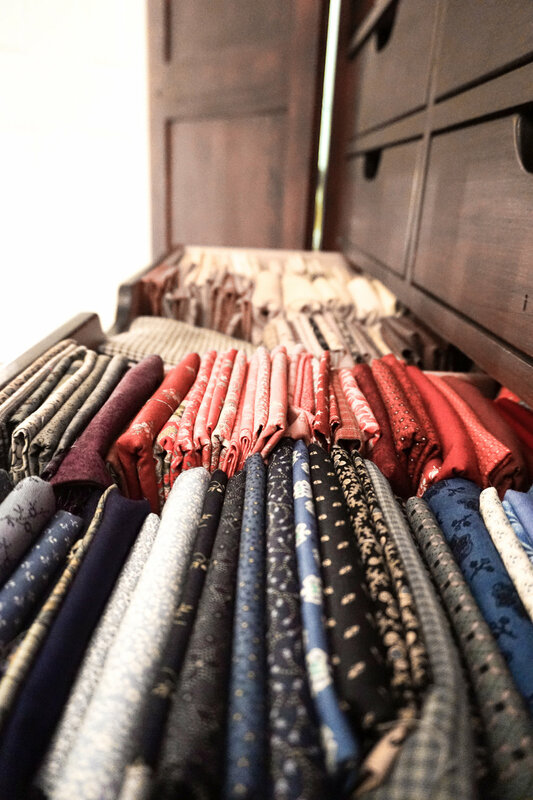 The folding really depends on the size of your clothes or linens and the size of the space they are going in. 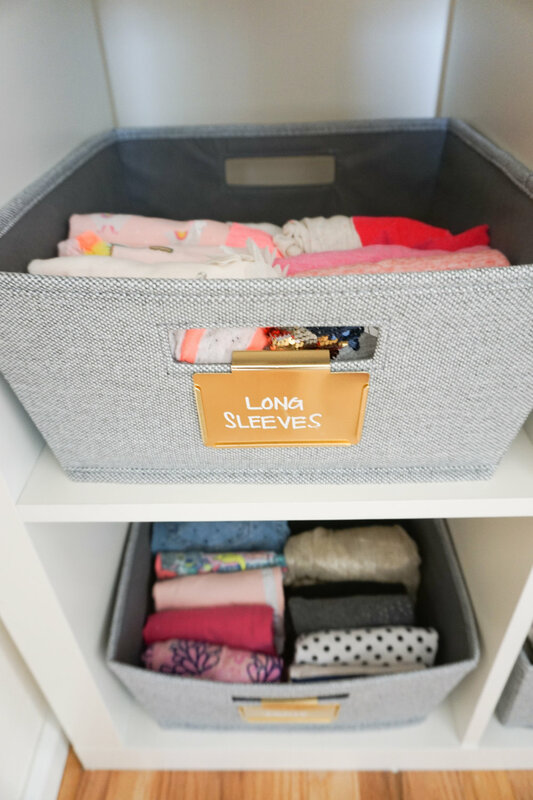 Once you find your file folding rhythm you will notice that your drawers look amazingly less like an unfolded pile of laundry and more like a tidy line up of your favorite items. Of all of the folding / hanging systems, I find file folding to be the easiest for all family members to maintain. My three year old ONLY wears athletic tee shirts (I pick my battles). 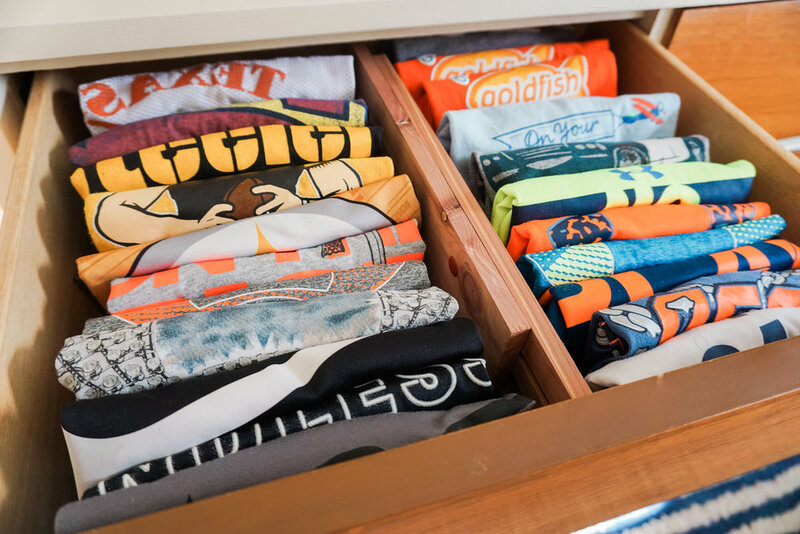 If I fold and stack them in the drawer two things happen - 1) I can’t close the drawer and 2) the piles are destroyed in one day because he digs to find the perfect shirt for that particular day. When the same shirts are file folded, and I have watched him do this, he opens the drawer, pauses as he looks at each one and pulls out just the one shirt he wants to wear. Yes of course it doesn’t look picture perfect all the time, but if my three year old can keep it tidy I assure you ANYONE CAN. 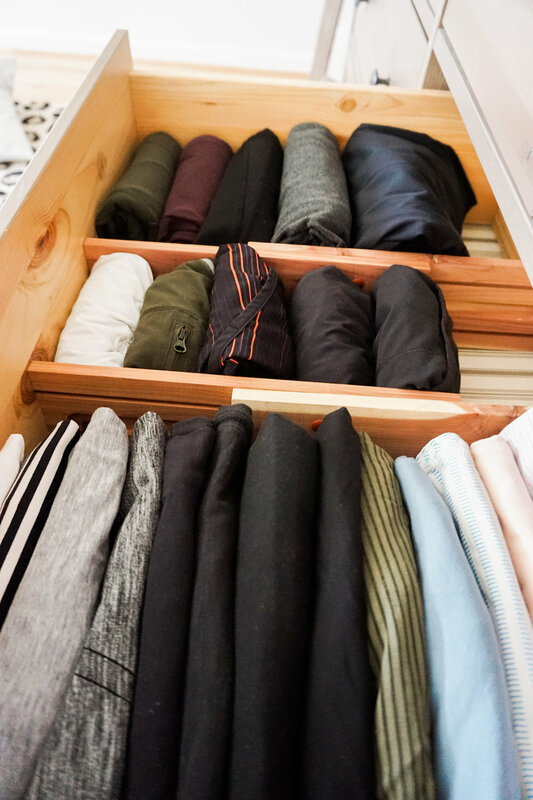 For wider drawers that allow for more than one row, use drawer dividers or drawer organizers to keep everything in its own lane. Start with one room. Or one drawer (again, baby steps). Get the whole family involved when you have that huge pile of unfolded laundry on your bed and you can’t go to sleep until it’s folded.